What do you get when one part orange juice and two parts bubbly combine? A reason to celebrate! How do you make brunch just a little more celebratory? That's easy: one part orange juice and two parts bubbly goodness. Attorney-turned-artist Alyson Thomas' playful graphics on these champagne glasses means that the formula for the effervescent favorite is always at hand. Her hand-drawn, graphic representation of the classic cocktail adorns the bright glasses with a playfully pseudo-scientific rendering of the drink's essential components. Glassware made in the USA, decorated in Edina, Minnesota. Check out Alyson Thomas's other Cocktail Diagram Glasses: Martini Diagram Glassware, Margarita Diagram Glassware, Vodka Tonic Diagram Glassware, Gin and Tonic Diagram Glassware, Mojito Diagram Glassware, Bloody Mary Diagram Glassware, Scotch & Soda Diagram Glassware, and Hot Toddy Diagram Glassware. My friend loves using these two glasses to make mimosas with her boyfriend. She loves how cute the glasses are and how durable they are. My exercise friends and I love to work out but we love to party too. Mimosas are a favorite in our group so these glasses made a perfect gift! Can't wait to give these as a special gift to my daughter. 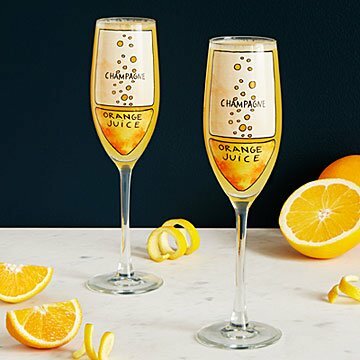 Great glasses, love these mimosas glasses !!!!! I fell in love with these glasses as soon as I saw them. Even though I don't drink & I'm from New Orleans, LoL I do enjoy a Mimosa every now and then. And our friends drink mimosas all the time :) These glasses are beautiful and will be used a lot. I'm anxious for him to open these on Christmas Eve so we can use them with the kids. It should be remarkable! Bought the Mimosa glasses along with the Bloddy Mary glasses as a gift for 6 of our friends. We all get together for a weekend once a year. We always have Mimosas with our breakfast. These glasses were a big hit with everyone. They loved both glasses! I love everything about the products. Have ordered often, and will again.